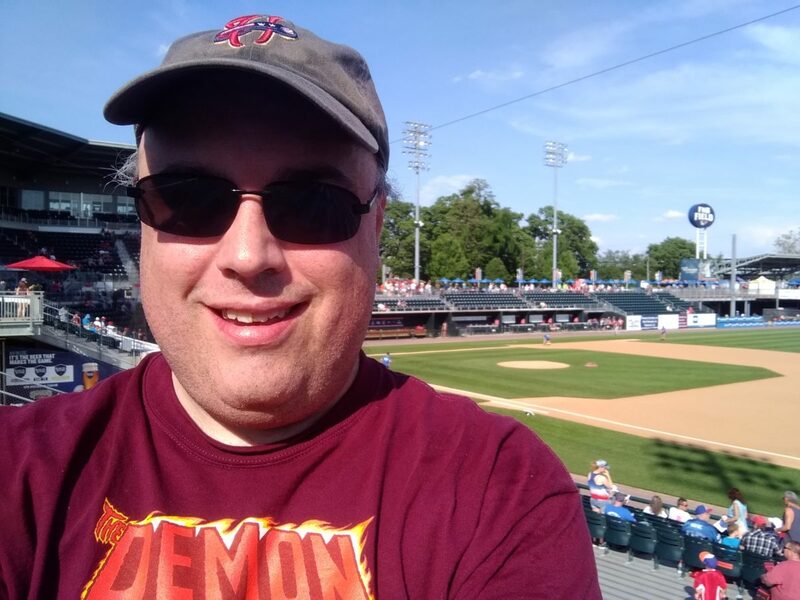 Saturday I bought a painting at the Harrisburg Senators game. I had been planning on attending the Saturday game, between the Senators and the Altoona Curve, for a while, as the Senators were inducting Stephen Strasburg into their Bobblehead Hall-of-Fame. In the middle of the week, the Senators also announced that Daniel Murphy and Brian Goodwin of the Washington Nationals would be on rehab assignments in Harrisburg over the weekend, and that was another reason to attend. What I didn’t know was that it was also “Art in the Park” night. Harrisburg does an art festival along the Susquehanna every Memorial Day weekend — I’ve checked it out when attending Senators game that weekend in the past — and for “Art in the Park,” the team partnered with a local charity, Caitlin’s Smiles. There was a table for Caitlin’s Smiles on the boardwalk on the third base side where they were auctioning several pieces of artwork that members of the team had created with children. I paused for a moment to look at the canvases, and someone with Caitlin’s Smiles talked to me a little bit about the charity, what they were doing, and what the auction was for. She encouraged me to look at other artwork that had been done that was on display around FNB Field’s concourse. On a spur of the moment decision, I suppose, I put a bid down on a piece done by a little boy named Joshua and Senators pitcher Bryan Harper, the older brother of Washington Nationals star Bryce Harper, that showed Poe Dameron and BB-8 from the Star Wars films. There were no bids on it, so I started the bidding with a 40 dollar bid. I then spent some time trying to decide what, if any, ballpark fare I wanted to have and, while doing that, I wandered around the concourse looking at the artwork. I’ve mentioned this before. As I’ve grown older, the Smithsonian museum that I enjoy more and more is the National Gallery of Art. Air and Space, as much as I loved it when I was younger, had faded in importance. While Air and Space speaks to humanity’s dreams, the National Gallery speaks to humanity’s heart. I eventually settled on a hot dog from The Spot for my game meal. Before the game, the Senators showed a video about Caitlin’s Smiles on the videoboard. I could not, unfortunately, hear the video as the P/A system along the first base line wasn’t working until about the fourth inning. Even without sound, though, I got the gist of the video, and I have to admit it made me cry. I am not sure if it’s the video I’ve embedded below, though it seems to be similar. They had raced out to a 6-1 lead in the early innings, but it all fell apart in the 7th inning, with Altoona closing to 6-5, then adding more runs in the top on the ninth to make it 10-6. I thought Daniel Murphy and Brian Goodwin both looked good (but I’m a terrible judge of these things). Both are rehabbing with the Senators again this weekend. It turned out it was the only bid on the art piece by Joshua and Bryan Harper. I was sure that someone else would want it and outbid me — jersey auctions, after all, seem to go for hundreds of dollars — which would be good for the charity, but now I wonder if the bid scared others off. Still, I wasn’t unhappy at all that I hadn’t been outbid; the money went to a good cause, and I had a unique piece of memorabilia. 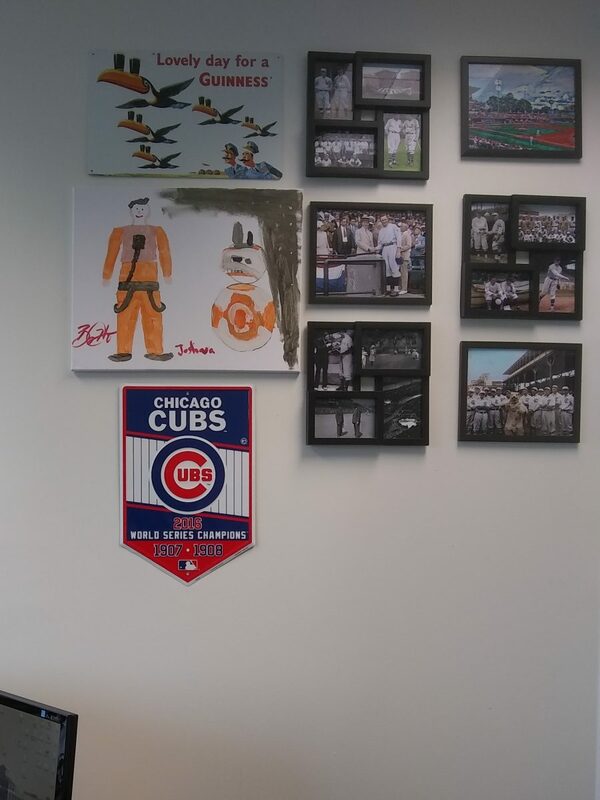 I hung the canvas in my office on Tuesday morning. The way my monitor is oriented, if I look up from my monitor, Joshua and Bryan’s painting of Poe and BB-8 is right there. Something to treasure, and a reminder that the things that are meaningful, the things that matter, are things that we do with others and for others, the things that touch the heart.